Dudes. I "published" this yesterday, and apparently there was a problem and it didn't post. So this was yesterday. I will still post today- because THE RULES. Ok. Go on. List making would fall under the category of My Favorite Things To Do. For sure. Whether it's on my phone, on post it notes, all over white boards, I love myself a good list. I've been keeping little Christmas Lists going, and now that the calendar has declared it close to the middle of November, THINGS ARE GETTING REAL, YO. I have the girls' list figured out pretty solidly. - The Goldie Blox set, plus the new Parade Float thing. I just hope if I order it on presale, that it will in fact, ship by Dec 1. Crossing the fingers! But then again! I say this to myself every time- I'm not going to overdo it. Then I get caught up in this youthful joy of SANTA! And PRESENTS! And I submit a massive amazon order. Every. Year. - These fingernail stickers. They picked these out of the Container Store catalog astonishingly quickly. They've been practically foaming at the mouth for them. And at $5 a pop, I am down. - An assortment of nailpolish options. In the past, we've added the sparkle topping to every 6 yr old manicure, and we've figured out that the sparkles are what doom the polish to coming off within a 24 hr period. So no sparkles. Just regular colors. The fingernails are a big deal when you're a first grader. Apparently ALL THE OTHER KIDS have their nails done on a more consistent basis. I guess I need to step it up. Santa will help with that. - This Princess Matching Game. This looks cute? And perhaps something they can play semi-independently? Like a sister game to spend some weekend hours. A Mom can always dream. He's a tricky one, and I've been really struggling to find things he'll like/I can handle all over my house. - Magformers? I would really like to play with these myself! He seems to enjoy the building blocks, Duplos, and train set, in doses. - Magnatab Letters- upper & lowercase. He's headed to preK anyway, right? May as well have some letter practice. I remember seeing this in a store, and I almost bought it. I am weirdly jazzed about them. LEARNING! YAY! It just looks like something we should have. I'm also seeing a MAGNET THEME emerging, here. - Magnetic Gears set- GEARS! MAGNETS! - Batman Stuff. He's really into the old Batman series. Papa was able to find the whole original series from the 60's on DVDs. It's been a lifesaver for me. I've seen the little Batman mask in the aisles of Target, online scoping has revealed some Classic Batman Action Figures. So those are obviously happening. Surfing Batman! Who WOULDN'T want that?! Speaking of Batman. 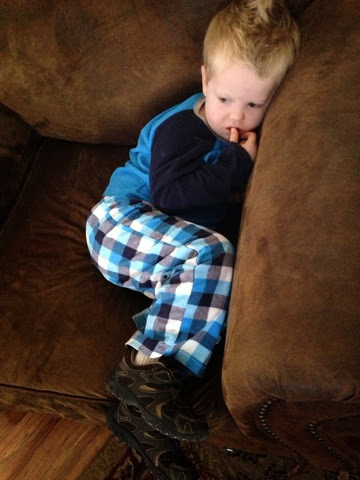 Here is Little Man curled up in his chair, absolutely spellbound with Batman. It is pretty much the only way to keep him in that chair for more than 5 minutes. Notice I didn't say "keep him quiet." Because HAH. Quiet the kid is not. Even during Batman, I'll hear "those bad guys are tricky!" or "Batman's gonna get them! He got him again!" I'm not sure who exactly he's talking to. I may throw out an "hmmm," or "yep!" Because when it's Batman time, I am usually in another room, doing things. Like laundry. And baking. And listening to far too many podcasts. I know, duh. 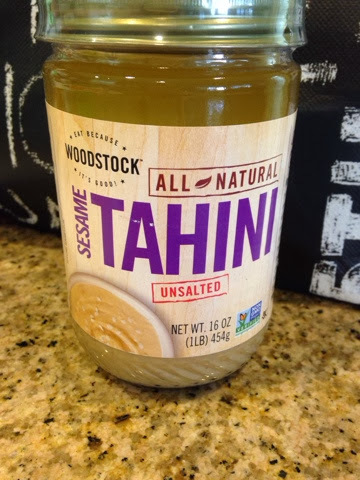 It SAYS Tahini. Yeah, but it says "sesame" on the side too. Is Sesame Tahini different than regular tahini? We'll never know because I will only buy this tahini forever and always. I know exactly where it is in the Smith's "Natural Foods" section.